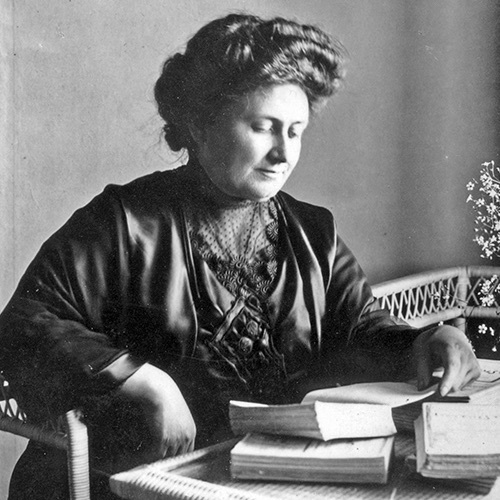 Dr Maria Montessori was the first female physician in Italy. Through her interest in paediatric psychiatry and educational theory she proposed her own philosophy of child development. This forms the basis of the Montessori Method. This is a frequently asked question. Montessori is not just an education it is a philosophy, a way of thinking that focuses on the trust and respect for the child. A Montessori education provides an enabling environment that allows children to use all their senses to explore their natural environment. Including the use of special materials designed to foster practical skills and refined senses. The Montessori Method focuses on The Child, The Teacher and the Favourable Environment. The Montessori approach is underpinned by the essential principle that learning is inseparable from development, so education centres on each child as a unique individual. The children of Wetherby House Montessori will become motivated and responsible for their own learning. Dr Montessori observed that the prepared environment was an essential ingredient for the success for development of the child. She realised that children relied completely on the environment for sensorial impressions through which they gain sense of the world. At Wetherby House Montessori we pay great attention to the layout and resources available to the child ensuring that everything is easily accessible meeting the dynamic needs of each child. Dr Montessori’s series of observations established that education was not what the teacher gives but a natural process carried out by each individual child. It is acquired not by listening to words and dictations but by experiences. The task of the teacher is to maintain order of the environment and to reinforce positive behaviour. They will lead positive examples and provide opportunities for learning. Children develop quickly in the early years, and early years practitioners aim to do all they can to help children have the best possible start in life. Children have the right, illustrated in the United Nations Convention on the Rights of the Child, to provision which enables them to develop their personalities, talents and abilities irrespective of ethnicity, culture or religion, home language, family background, learning difficulties, disabilities or gender. At Wetherby House Montessori, we understand that not all children will be continuing their education in Montessori schools, and that almost all our children will attend traditional independent and state schools. Taking this into consideration, we adhere to the guidelines set out by the EYFS absolutely, and are regulated by the same authorities as every other setting. We deliver the EYFS curriculum in full and are able to offer a broad and meaningful base of knowledge to all children in our care. The document below, Development Matters in the Early Years Foundation Stage, is a fantastic resource for understanding the principles and expectations behind the EYFS. We will provide Yoga sessions for your child taught by an experienced qualified instructor. They will introduce a range of yoga poses, stretches and breathing techniques to maintain flexibility, develop strength, improve levels of concentration and relaxation. Children start weekly French lessons in Dandelions with a specialist French teacher. The sessions are fun and consist of stories, rhymes and songs. The teacher uses props such as puppets and pictures to bring the lessons to life. Terms are themed so that children can pick up lots of relevant vocabulary. Skills such measuring, weighing, pouring, spooning, mixing are all present in cooking activities. We place great value on regular cookery sessions and encourage parents to involve children in food preparation at home. At Wetherby House Montessori we believe children who have helped prepare a dish will be more likely to taste it. We provide weekly tennis sessions to children in the Sunflower Room. They will receive a fun programme taught by a professional coach. The sessions will enhance balance, coordination, improve confidence, self-esteem, and build essential communications skills, team work, and most importantly lay foundations for listening and learning. Creativity emerges as children become absorbed in action and exploration of ideas. We embrace music and movement through instruments, dance and songs. Allowing each child to express themselves. Superstars Sports offer a mixed curriculum of sports skills that is informed by the EYFS. Their lessons cover everything from football to gymnastics. These lessons are delivered to children over two and a half.